How much difference is there really between Ricky Gervais and his best-known creation? They’re both loudmouths, upstagers, look-at-me-ers. They’re both convinced of their God given talent. And they do look an awful lot alike. In ‘Life on the Road’, perennial loser David Brent heads off on a big comeback tour with his band, a last-ditch attempt to salvage some kind of dignity from the wreck of his life. For Gervais, after a string ropey sitcoms like ‘Life’s Too Short’ and ‘Derek’, is this a prove-it-or-lose-it moment as well? If yes, the gamble has mostly paid off: ‘Life on the Road’ is a consistently funny movie that if you’re a Gervais fan you’ll love. If nothing else, it’s a reminder of what a beautifully realised and horribly relatable a character David Brent is. Whether he’s storming around his new office at a sanitary supply firm, making wanking gestures to horrified co-workers, or on stage urging his audience of three to consider the plight of the Native Americans, we all know someone a bit like this man. But this is still a Ricky Gervais joint, with all the baggage that brings. The first time Brent puts on a ropey patois accent it’s pretty funny; the second, not so much. Rapper-turned-comic Ben Bailey Smith (aka Doc Brown) is on hand to defuse some of the most aggressively crass and un-PC moments, but there’s only so much a kill-me-now eye roll can accomplish. And a few scenes are just plain nasty: one involving a woman in Brent’s hotel room is spiteful and unfunny. So yes, being stuck in a cinema with David Brent for 96 minutes can be trying (the lazy ending doesn’t help). But when Gervais is on an improvisational roll, Brent digging himself deeper and deeper into some awful pit of social awkwardness, we can’t help but remember why we love to hate them both. As possibly the only person in the UK who never watched "The Office" I went to see the film with a totally open mind although I did enjoy "Extras" and "Derek" in more recent times. There were some very good gags in the movie in which the Brent character cashes in some of his pension pots to finance an obviously doomed attempt to put a band on the road and go big time. Brent is despised by most of his workmates and the musicians he hires for the project. A couple of girls at the sanitary products company where he is now working as a salesman feel sorry for him and ultimately one of the band pities him for the money he is wasting. The humour in this movie is almost entirely based on Brent making an embarrassing or utterly stupid remark and then emitting a high-pitched whinny of a giggle. After a couple of minutes it failed to amuse me although I sat through the entire film and not many of my fellow members of the audience were laughing either. 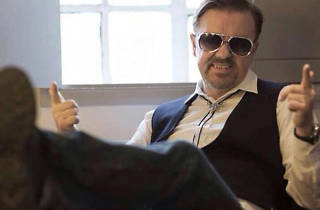 Gervais is brilliant at creating sympathetic underdogs on TV but for me Brent isn't one of tham. I grew up watching the original office without never understanding why - I always felt that it was so bad that at some point became good and I was looking forward to have this feeling again. It's true that you have this feeling now and then during the film but I felt that they forced it too much when before it felt natural and real. Regardless I had a good time and shared a few good and embarrassing laughter’s. I was a bit hesitant to go and see this film as often I find that TV comedies do not migrate to the big screen very well. My husband was looking forward to it, so as there was not much else on, I agreed to go. 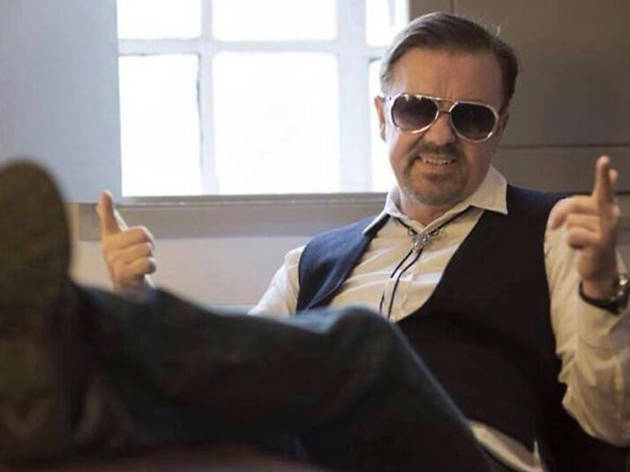 There was the usual David Brent awkwardness and Ricky Gervais cleverly manages to create David Brent as an odious character whilst at the same time, creating some sympathy for him, so we want it to turn out all right for him in the end. It was better than I expected and there were some funny moments, some near the mark moments and a fair few over the mark moments. Some of them we felt guilty for laughing at as they were so non-PC, but it fitted in with Brent's awkwardness. Even though I enjoyed it, I still feel it is better as a Christmas special (after 9pm!) rather than being strung out to fit long enough for the big screen. Worth a look if you don't get offended easily.